The studios are not open to the general public unless you are a guest as part of a studio audience or a member of a studio tour. Universal Studios, Warner Bros. Studios in Burbank, Paramount Studios in Hollywood and Sony Pictures Studios in Culver City welcome visitors on their exciting and informative "behind the scenes" tours. Click on the links below to visit their websites for information. Warner Bros. Studio Tour Hollywood brings you closer than ever to the legendary entertainment you know and love. Get ready to explore our iconic backlots, The Archive and The Picture Car Vault. Plus, you'll view one of our many soundstages where today's hottest TV shows and movies are made. With actual filming happening all around you, no two tours are ever alike. This is Hollywood like you've never seen it before. This 2-hour guided walking tour will give guests a behind-the-scenes look at a working studio, where movie magic has been made for almost a century. Tours will swing by historic stages where Dorothy followed the Yellow Brick Road and where Spider-Man battled bad guys. Tours may also visit the homes of smash-hit games shows, "Jeopardy!" and "Wheel of Fortune," and only on the Sony tour will you walk under a soaring 94-foot tall rainbow! Explore over a century of Hollywood history and witness more in the making with an intimate tour of the Paramount Pictures studio lot. During your visit, a knowledgeable guide will lead your small group on a behind-the-scenes look at the longest operating and only remaining major studio in Hollywood. You'll see where some of the most celebrated motion pictures and TV shows were made and leave feeling like a part of film history. Visit 13 city blocks on four acres of historic studio lot in the largest set construction project in studio history, built with creative consultation from Steven Spielberg himself. You'll laugh along with comedian Jimmy Fallon, the video host of the Studio Tour, who introduces entertaining clips seen on HD monitors in the trams to augment the live Studio Tour guide narration. Additional helpful links for L.A. area visitors are posted below. Please visit their websites for more information. 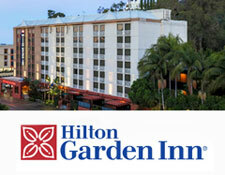 Welcome to Hilton Garden Inn Los Angeles/Hollywood Nestled in the heart of Hollywood, the Hilton Garden Inn Los Angeles/Hollywood hotel offers an ideal location for business and leisure travelers. Our intimate hotel is just a short walk, drive or commuter trek to many prominent corporations and attractions including Disney Studios, Live Nation, Capitol Records, and Netflix. Walk to the world famous Hollywood Walk of Fame and Hollywood Bowl, discover the Grauman's Chinese Theatre and Dolby Theatre, or take one metro train stop to Universal Studios. The studio location map that is provided with the tickets you print will show the general location of the studio facility. For more detailed maps and/or driving directions, please select a link to one or more of the websites posted below. with these companies or facilities and we are not responsible for their website's contents or any goods or services offered. Please contact them directly if you have any questions or require addtional information. Thank you.